LONDON (AP) — Concerns about political developments in Britain and Italy kept a lid on global stock markets on Wednesday. Meanwhile oil prices recouped some lost ground. KEEPING SCORE: In Europe, France’s CAC slipped 0.4 percent to 5,082 while Germany’s DAX fell .3 percent to 11,441. The FTSE 100 index of leading British shares was steady at 7.055. U.S. stocks were set for a flat opening with Dow futures and the broader S&P 500 futures unchanged. BREXIT UNEASE: In Europe, traders were unsure as to whether British Prime Minister Theresa May would be able to get the Brexit deal she has agreed with the European Union through her Cabinet and then through Parliament. May is presenting the deal to colleagues later. Investors are wondering whether any ministers will quit in protest as they try to assess the probability of May being able to push through her deal. ITALIAN BUDGET: Meanwhile in Italy, the country’s populist government maintained its controversial plan to raise its budget deficit to 2.4 percent of annual GDP as it responded to EU demands for changes. However, it made tweaks during a late-night Cabinet meeting Tuesday, including adding plans to sell off some government real estate. “It’s not just the U.K. that Brussels needs to worry about,” said Erlam. TRADE WORRIES: Fears about global growth continue amid trade tensions between the U.S. and China. Traders drew encouragement from a report out of China saying that country’s top economic adviser might visit Washington ahead of a planned meeting between Chinese President Xi Jinping and U.S. President Donald Trump at this month’s Group of 20 gathering in Argentina. The U.S. and China have raised tariffs on billions of dollars of each other’s goods. 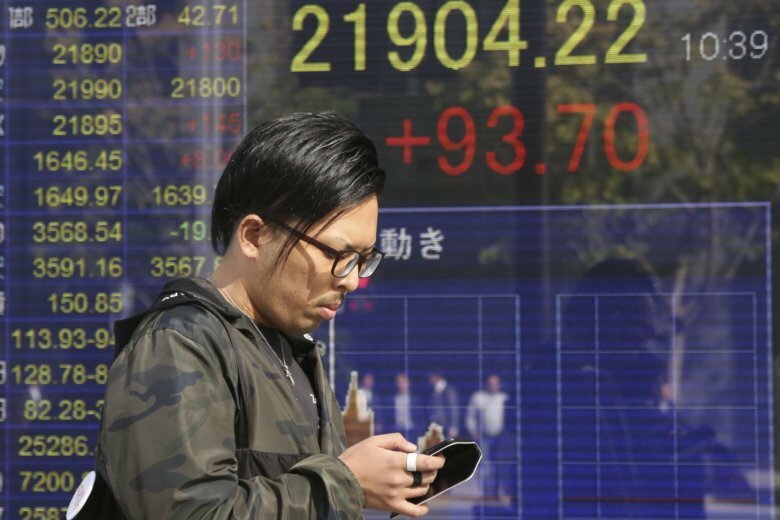 ASIA’S DAY: Japan’s benchmark Nikkei 225 inched up 0.2 percent to finish at 21,846.48, while Australia’s S&P/ASX 200 lost 1.7 percent to 5,732.80. South Korea’s Kospi edged down 0.2 percent at 2,068.05. Hong Kong’s Hang Seng fell 0.5 percent to 25,654.43, while the Shanghai Composite was down nearly 0.9 percent at 2,632.24. ENERGY: Oil prices recovered some recent losses with benchmark U.S. crude oil was up 46 cents at $56.15 a barrel while Brent crude, used to price international oils, rose 79 cents to $66.26 a barrel. CURRENCIES: The euro was steady at $1.1283 while the dollar rose 0.1 percent to 113.88 yen.